Striker James Collins admitted there was a sense of relief at getting his place back in the Town team at Bristol Rovers after missing the 4-0 win over Doncaster when on international duty with Ireland. The leading scorer might have had 20 goals to his name prior to Saturday, but was still left waiting to see if he would involved from the start at the Memorial Stadium, after Luton produced one of the best displays of the campaign the previous weekend. To beat Doncaster, a team who are a very good side, 4-0, is one hell of a statement, so credit to the lads for that. 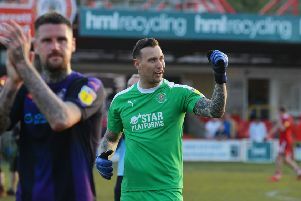 Collins, who had been following the Hatters score while away, said: “Of course, we’ve got that quality in the team, people to come in when people are injured or missing for whatever reason. “To beat Doncaster, a team who are a very good side, 4-0, is one hell of a statement, so credit to the lads for that. “We didn’t kick off until six o’clock so I saw we were 1-0 up when we were warming up. Hatters boss Mick Harford knew that Collins would be in excellent shape to fit back in, despite not playing for Ireland in either Euro 2020 qualifier. He was proved right too, the forward in the right place to tap home Jack Stacey’s cross for a 21st goal of the campaign after 17 minutes. The Town chief said: “He told me had a mini pre-season when he was away with Ireland, Mick McCarthy and the crew over there. Collins was left on the bench for both matches, 1-0 wins over Gibraltar and Georgia, but still felt being away on international duty for the first time was a more than worthwhile experience. He said: “I thoroughly enjoyed my time away and to come back into the side and get a goal and a massive three points, is credit to everyone involved. “I didn’t manage to get any minutes on the pitch but they were two big games for us . “It was a new management and you’ve got to look at the quality that’s over there in the squad, they’re all Championship, Premier League players. Ireland’s next games are in June as they head out to Denmark and then entertain Gibraltar. Collins is hoping to be selected once more, adding: “Yes of course, all I can do is keep scoring goals for Luton though.